Anna*, a survivor of gender-based violence, recently registered her business—a bistro—in Armenia’s capital city, Yerevan. Prior to joining the NEF’s Advancing Gender Equality and the Rights of Survivors of Gender-Based Violence in Armenia (AGERS) project—financed by the European Union and implemented by NEF UK and GCCI—Anna worked as a talented baker at a local establishment for many years. Each day, she did her best to earn money for her boss, ensuring only the best, handmade products made it onto the bakery’s shelves. Though she enjoyed her work, the low salary and long hours she worked at the bakery made her question whether she would do better to start her own business. Anna toyed with the idea for more than three years, but without start-up capital the likelihood that she could try and succeed at launching her own business seemed dim. Anna learned about the AGERS project in June 2015, and was selected to participate in enterprise-track trainings one month later. Over the course of the two-week class, she gradually came to realize that she could achieve her dream of opening a bistro with the support of NEF UK and Gegharkunik Chamber of Commerce and Industry (GCCI). Through the project, Anna learned that her business model was high risk, and to be successful she would need to anticipate common challenges faced by restaurants and plan ahead to avoid them or minimise their impact. The project team helped Anna to register her business, conduct risk assessments, negotiate a rental space, and understand tax law. 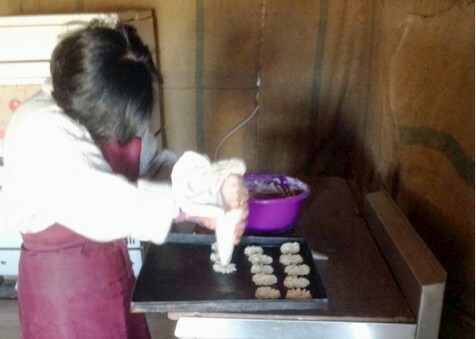 She used the small grant she was awarded through the project to stock her restaurant with tools and ingredients. To limit costs, Anna recruited her son Vardan* to contribute to the management of the bistro. Vardan had always struggled with health issues, but continued to work odd labor-intensive jobs to care for the family out of necessity. For Vardan, the bistro presented a welcome alternative to his then-physically-demanding line of work. Working together, Anna could focus on production while Vardan focused on advertising, sourcing fresh produce, and managing delivery logistics. Two months after receiving her grant, Anna earned enough of a profit to cover the restaurant’s costs. With business on the rise, her self-confidence continues to increase by leaps and bounds. *Names have been changed to protect the beneficiary’s identity.